Don’t make your children pay the price for your divorce! for the sake of your kids! You’re facing the most difficult conversation you may ever have. You don’t want to hurt your children. And there’s so much at stake. My name is Rosalind Sedacca. I’ve been where you are now – and I understand how you feel. Anxious, worried … maybe even terrified at the prospect of talking to your kids about the changes ahead. … a Create-a-Storybook GuideTo Preparing Your Children – with Love! Endorsed by therapists, attorneys, mediators, coaches, educators and other divorce professionals world-wide. At a time when it’s hard to feel positive, I can show you how to create the most positive outcome to this tough situation – for the sake of the children you love. I never thought my marriage would end in divorce. I’m sure you didn’t either. But mine did end more than a decade ago. And now it’s happening to you. Whether you’re getting divorced or separated, it’s a challenging time. For you, your spouse, and especially for your innocent children. I know … because I went through it too. Are you facing the same dilemma? when to break the news to your kids? just how you’re going to tell them? whether to do it alone or with your spouse? I’ve been there. And I stayed up for many sleepless nights trying to figure out the best way to break the news. Ultimately I came up with an innovative, yet simple new approach that was very successful for me and the hundreds of other families that have been using it since I launched my book. I am excited to share this approach with you. And I want to remind you that you’re not alone. doesn’t just tell you what to say. It says it for you! Let’s face it, telling your children about the divorce may be the most difficult conversation you’ll ever have. Why leave it to chance? I wrote this guidebook so you don’t have to worry, spend sleepless nights or beat yourself up about making a mistake … saying the wrong things … falling apart … or not having answers to your children’s immediate questions. I know there are many books about children and divorce. What makes this one unique? My innovative Create-a-Storybook™ concept. 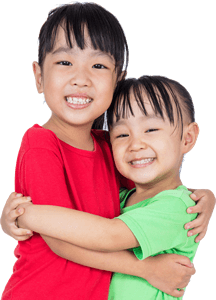 I’ve prepared for you an actual template – the word-for-word text that tells you just what you need to say – in age-appropriate language for children 5 to 10 or 10 to 15. And then I guide you, step-by-step, in preparing an attractive personal family storybook, in a photo-album format, that your children will want to read. You are, and always will be, loved my Mom and Dad. You are, and will continue to be, safe. You are not to blame for any of this. Mom and Dad will still always be your Mom and Dad. This is about change, not about blame. No other book anywhere shows you how to create a customized storybook uniquely about your family … your children … and your divorce! The benefits for both you and your children are immeasurable. 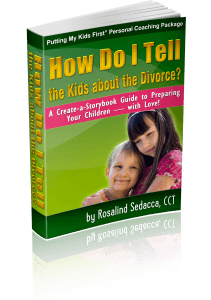 ready to tell your kids about the divorce – because you will be! thank you when they grow up, as my son did, for trying your hardest at all times to create a Child-Centered Divorce! Why, you may ask, should I listen to you? Who am I to advise YOU about how to tell your kids about your pending separation or divorce? I’m a mother who created a unique storybook concept that worked quite successfully with my own family! (My son, who is now a grown young man, proudly wrote the introduction to my book.) Click here if you’d like to read it. I’m a Certified Divorce Coach and Founder of the Child-Centered Divorce Network — celebrating its 10th Anniversary in 2016! I’m the author of the Parenting Beyond Divorce guidebook, a 10-hour Mastering Child-Centered Divorce Audio Coaching Program with Workbook, an 8-hour Anger Management course for co-parents, several other eCourses and ebooks, dozens of articles and newsletters – as well as contributions to other people’s books – on personal, family and business relationships. I’m also wise enough not to be doing this alone! Six professional Therapists share their expertise with you! That’s right. Because this is such an important message, not one or two, but six professional therapists, experienced with divorce and mediation, contribute their considerable expertise to this guidebook. Their insight, advice, commentary and support add significantly to the value of How Do I Tell the Kids about the Divorce? – making it a resource you can turn to again and again in the days, weeks, months … and even years ahead. And that’s not all. Additional endorsements continue to come in every day as word about this valuable guidebook keeps spreading! Why isn’t this book available in any book store? Many people ask me about that. And the answer is simple. I’m offering my ebook to you in digital format – as a downloadable file – for a very strategic reason. Unlike most books, How Do I Tell the Kids about the Divorce? was designed to be personalized – by you – for your family. And that’s best done through a simple digital download. Your guidebook includes two fill-in-the-blank templates. One for children aged five to ten. The other for older children up to age fifteen. They’re very easy to complete, adapt, customize and/or change in any way that suits you and your personal circumstances. Clear instructions guide you, step-by-step, in creating your storybook, answering your questions section by section. And because this is a download, you get the book right now – when you need it most – so you can immediately begin your journey to peace of mind. I know the template idea is really wonderful. But the value of this guidebook doesn’t stop there. Throughout the book you’ll benefit from the guidance, experience and support of six expert professionals who take you from your first conversation through pitfalls to avoid, and signals to pay attention to, in the weeks, months and even years down the road. The advice of my expert contributors will provide additional insight to help you create the storybook that best suits your children and your family. You’ll also find lots of suggestions about how to add your own individual touch to the style, design and format of your storybook – from the most basic approach to turning out a highly creative work of art. While there’s no right or wrong way to make your storybook, you can be totally confident that it will convey the right message you want to give to your kids! and take advantage of $146.00 worth of free bonuses! Every child and every family is unique in how they react to news about separation or divorce. This incredibly valuable resource tool enables you to “Dump It Here & Stay Clear.” Use it immediately after your initial conversation with the kids to record key elements of the experience. It will provide stability, support and clarity during the weeks and months to come. Strategic questions will guide you in discovering and responding to important issues relative to your divorce and your family. These insights will help you focus on topics that need clarification … emotional and physical reactions that need immediate attention … questions that need answering … and situations that might best be handled through professional guidance. By keeping track of the different ways everyone in your family responds to the challenges at hand, you will be better able to understand their perspective — and address their needs. This Special Report, written by one of the expert contributors to the Guidebook, provides a comprehensive overview of what’s most relevant to include when first talking to your kids about your divorce. The convenient Checklist format helps make sure you don’t overlook essential messages when answering your children’s questions. 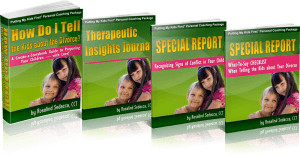 You’ll find the reassurance, guidance and critical reminders in this report will relieve your anxiety as you face one of the most difficult conversations any parent is likely to have with their children. The first step in helping your children cope with news about your divorce is being able to recognize various behaviors or “signals” that tell you something is wrong or needs attention. There is always a reason for what your child does. To discover that reason – and interpret those signals – it is important to maintain the proper perspective. This informative report focuses on some of the most common “SIGNALS” which may indicate that something is troubling your child – providing insights to help you better understand and respond. Take advantage of the experience and expertise of a therapist who understands the emotional, physical and spiritual challenges faced by parents and children of divorce. Amy Sherman is a Licensed Mental Health Counselor who has worked with families in crisis for more than a decade, experiencing first hand, the emotional impact of divorce on children. She understands the intricate dynamics between children, parents and spouses and has been able to successfully help many troubled families as they move into and through divorce. Use this valuable time to ask questions, clarify problems, discuss personal issues and get keen insights into how to best create a Child-Centered Divorce in your family. Amy is a caring, compassionate professional who can guide you in choosing the most positive course of action as you embark upon the road to a successful future. In addition to all these bonuses — to assure your satisfaction — I’ll give you a full money-back guarantee! I’m so confident that you’ll get such value from How Do I Tell the Kids about the Divorce? that I make this Guarantee: If, after reading the content, absorbing the advice from my six expert contributors, using the fill-in-the-blank templates and reviewing the extensive directory of resources, you are not completely satisfied with the value of this ebook, send me an email telling me why (because I value your feedback) at [email protected] and I’ll give you a complete refund of your purchase price. No hassles. This guarantee is in place for a full 8 weeks, so your order today is totally risk-free! I’m sure you agree that’s as fair a deal as you can get. You have nothing to lose and so much to gain – for yourself, your children, your entire family! The support you need to move ahead with your divorce! a total package with ebook and bonuses worth more than $180.00! How Do I Tell the Kids about the Divorce? 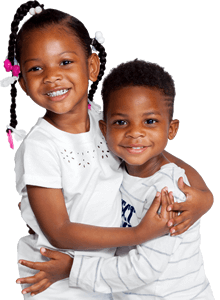 A Create-a-Storybook Guide to Preparing Your Children With Love! All this for just $29.00! Certainly that’s a lot of value for very little money. Your family deserves the best you can give them. Here’s the perfect way to start building this new chapter in your family life on the strongest foundation … and in the most positive direction. Take advantage of the wisdom I’ve gained through my own personal divorce experience. Learn from the cumulative expertise shared by top professionals in the field. Reserve your copy of HOW DO I TELL THE KIDS ABOUT THE DIVORCE? – along with all the valuable FREE bonuses – now! Just click the link below to get your download today. Author, How Do I Tell the Kids about the Divorce? 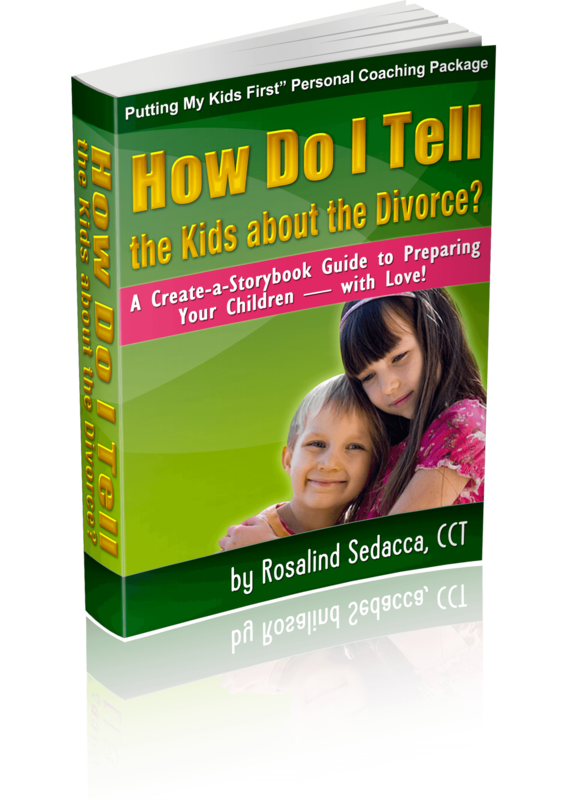 P.S: When you order your new ebook and free bonuses, you are welcomed into the Child-Centered Divorce Network. That means you’ll have easy access to vital information for you and your family. 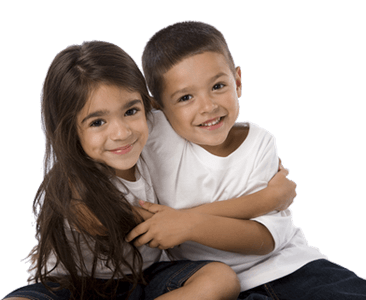 This includes a content-rich weekly ezine, timely new articles, teleseminars, coaching services, expert interviews, special events and networking opportunities with other Child-Centered Divorce families. Important note: I respect your privacy and promise you will not be bombarded with product pitches or other annoying and invasive offers. I pride myself on treating members of the Child-Centered Divorce Network with the thoughtfulness and respect they deserve – just as I would choose for myself. I am passionate about getting my professionally acclaimed guidebook to all the divorcing or separating parents who need it, but I cannot guarantee the inclusion of all the bonuses – free of charge – in the future. So I urge you to take advantage of this tremendous $29 offer now. You will be so glad you did! If you’re not ready to order How Do I Tell the Kids about the Divorce? and take advantage of the free bonuses and telecoaching session, at the very least do sign up for my free ebook on Post Divorce Parenting. You’ll get great advice you can use during and long after your divorce. I urge you to enter your name and email address at www.ChildCenteredDivorce.com.